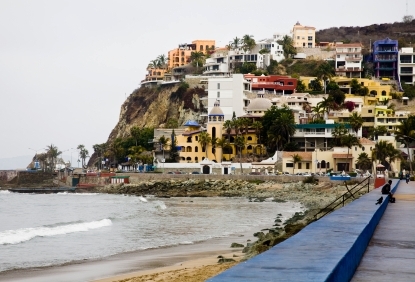 Mazatlan is the second largest city in the Mexican state of Sinaloa with a population of more than 350,000. This popular resort is known for its fishing and its beacehes. Mazatlan was founded in 1531. It is located on the coast above Puerta Vallarta. Many North Americans retire here for the warm weather and inexpensive lifestyle. During the 40's and 50's many hotels were built here to accommodate the tourist trade. There are many time shares and vacation homes available. During the 40's and 50's many hotels were built here to accomodate the tourist trade. Today there are many time shares and homes purchased by retirees. There is also great variety in neighborhoods and prices of homes and condos. At one site we saw homes available for far less than $100k (US) and well into the millions. Many nice places were in the $200s and $300s. 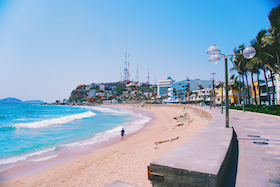 Mazatlan is a well-established city in Mexico. The city is very old and has been restored to its former glory. Its Centro Histórico is a great resource. Located on the sea and offers plenty to do, all for a much lower price than in the USA. John Wayne and his buddies used to come here for its excellent sport-fishing. The Malecon from Mazatlan along the Pacific coast, is considered one of the longest in the world and features high cliffs, monuments, gazebos, old buildings, and hotels. Mazatlan is in northern Mexico on the Gulf of California, just across the Gulf from the southernmost tip of Baja Mexico.The state is Sinaloa. The Teatro Angela Peralta, located on the Plazuela Machado, houses a concert hall, galleries, an art school and a highly regarded conservatory of music and dance. The Plazuela, located in Centro Histórico is the local center of culture with festivals, pageants, art shows, etc. Carnavale is a very big deal in Mazatlan. The crime rate here is high and mainly related to the drug trade. Mexico has a full range of modern medical facilities. While your USA or Canadian health insurance will not work here, you can buy health insurance policies for a reasonable amount to protect against serious illness or accident.